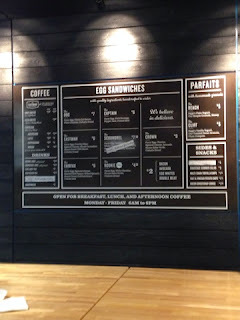 Katy's Kitchen: The Eastman Egg Company Grand Opening! The Eastman Egg Company Grand Opening! PSA Friends - It's not too early to get your flu shot. I had big plans for the blog this week that were all derailed when I had a fever of 101 and no appetite. 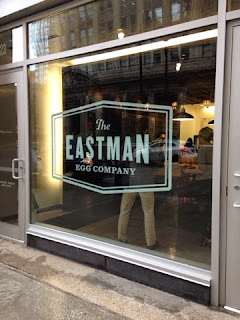 Luckily, my appetite is back and just in time for the Grand Opening of The Eastman Egg Company's storefront! I've given the Eastman food truck some love on here before so I was obviously excited when I heard they were opening a brick and mortar store on Wacker, right on my commute from Union Station! 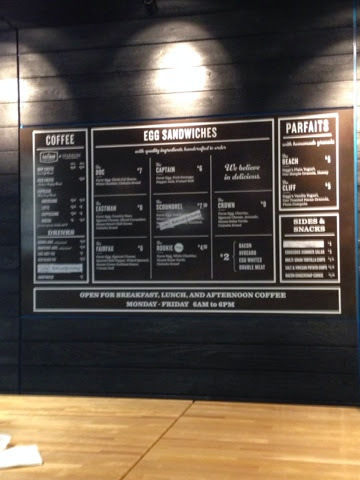 They've expanded their menu to include 3 more egg sandwiches as well as more drinks and yogurt parfaits. Normally my rule is "If its a steakhouse, you get the steak." (Or in this case, "If its an egg sandwich place, you get the egg sandwich.") You can usually save yourself a lot of disappointment if you get what the restaurant specializes in. 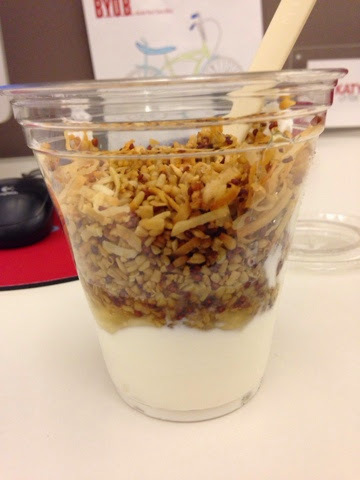 My appetite may be back, but I wasn't super hungry this morning so instead of getting an egg sandwich I tried to Beach Parfait that has plain yogurt, honey, and house made granola. This was a fabulous choice. They use Siggi's Yogurt (which is what I've been buying, especially after trying the yogurt in Europe that isn't loaded with sugar) so you've got a thick and creamy yogurt paired with sweet honey and a delicious and crunchy housemade granola. Perfect for a healthy breakfast. If you're in the Loop, make sure to check out Eastman for breakfast, lunch, or an early dinner. They are open from 6am-6pm at 23 N Wacker.